Every search engine optimization or Adwords campaign starts with proper selection of keywords. Its important to find out the real worth of keywords in order to fetch the maximum return on investment. Google Adwords Tool does provide you with all the data that you need to plan your campaign effectively. But, there are some other factors which when considered while selecting keywords can earn you a lot more positive results. These factors are well covered in the Netmark's Keyword Intelligence Tool. 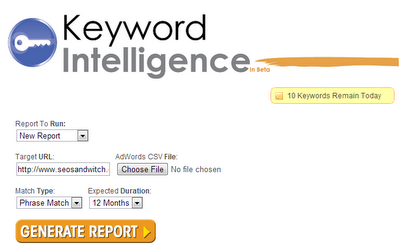 Now, let's discuss the awesome features of Keyword Intelligence. 1- It shows the Global Monthly Search Volume and Local Monthly Search Volume for selected keywords. 2- It shows the number of keyword competitors. 3- It gives an estimate of the Cost Per Click. 4- It shows you the amount of competition for individual keywords. 5- It gives an idea of the value of the keyword on a 0-100 scale. 6- It shows the SEO Clout Score which is a rough idea of the relevancy of the content to search engines. 7- It gives an idea about the rankability factor which determines how harder or easy it is to rank for that keyword. 8- It gives an idea about the seasonality factor which determines how the search volume has fluctuated in the past. Please Note:- The tool in the free version offers upto 10 keyword analysis per day. Here is a quick video to learn more about this tool.